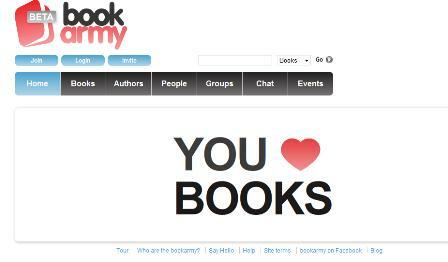 BookArmy, a literary recommendation website, is the latest social media project from publisher Harper Collins. It was originally planned for an official launch this year, but that has been delayed, and the site is now in private beta. Harper Collins’ other social media site, Authonomy, provides a way for the publisher to outsource its slush pile by having aspiring writers publish part of their work online and have it rated by others, in the hope that the cream rises to the top. BookArmy aims to be a recommendation engine for book lovers, having them rate the books they already love, and recommend others to them. You can then fill out your profile by adding a picture, describing yourself, and rating and reviewing more books. When reviewing books, you are asked to give it a rating out of five stars and add a text review. People don’t always want to spend time writing reviews, so perhaps a more comprehensive marking system may be a better way to get more book ratings on the site. Adding more books to your profile can be time-consuming too. Having entered the book title, or part of it, you choose the correct book and author from the list before the review and rate option appears in a pop up window. There is a drop down menu for you to select the book you want, but it could be a bit easier to use. All of this means that, if you want to upload more of the books you have read to give the site and other users some good information to recommend titles to you, this will end up being quite time-consuming. There isn’t necessarily an easy answer to this: the system of uploading books also takes time on BookRabbit, but auto-suggest options need to be effective, and the site needs to load review screens fast to make it as easy as possible for users. Clicking on the page for a book will give you the blurb for that book as well as the average user rating, while scrolling down the page will give you reviews that people have written about the book. If this is one of your favourite books, and you want to connect with other users with the same tastes, you can join or create a ‘group’ around that title. Most of the books I came across have a link to purchase the book on Amazon, though these ‘buy the book’ links don’t particularly stand out, which makes the commercial side of the site seem more like an afterthought. Some teething problems are to be expected in a private beta, but BookArmy does have plenty of useful features, and I think building a social network and recommendations around books should work well. One site that has already done this effectively is BookRabbit, which I looked at in May. Its bookshelf feature, where users upload and tag photos of their bookshelves at home, makes it more visually appealing, though it still takes time to tag and rate your favourite books. BookRabbit does put more of an emphasis on the e-commerce side of the site though and, having been going for several months, has more user generated content on there, making it more effective as a recommendation engine.